Find our cheapest flights to Shanghai from Auckland, Wellington, Christchurch, and Queenstown. Discover the enduring mystique and energising magic of an Oriental metropolis that's an irresistible mix of ancient and advanced. A heady collision between the old world and the new, western comforts and eastern ideals, pop culture and tradition, Shanghai evokes feelings of awe, curiosity and anticipation. Nicknamed the 'Nevernight City' in the 1930s, this sprawling metropolis thrums with the sort of electric energy you'd expect from China's most glamorous and forward-facing city. It's also a launch point for further travels into China, including the ancient-meets-new city of Beijing. Direct (non-stop) Shanghai flights from Auckland depart every day in the late evening. As well as Economy and Premium Economy seats, you have the option of Business Class. It's no problem to fly to Shanghai from a provincial airport in New Zealand. Simply arrange a domestic flight to Auckland in time for your international departure. Shanghai's awe-inspiring skyline symbolises China's modernisation. The city's facelift, which took three decades and many billions of dollars, has resulted in a contemporary travel experience that stretches all the boundaries. The Auckland to Shanghai flight time is usually just over 12 hours. Shanghai Airport (aka Shanghai Pudong Airport) is a one-hour taxi ride from downtown Shanghai. Alternatively you can catch the Maglev train to Longyang Road (eight minutes), then catch a taxi to your accommodation from there. If you're interested in cheap flights to Shanghai, we run regular special offers. You can sign up for low fare alerts to receive early notice of best flight deals to Shanghai. You can also sign up to our newsletter to receive regular updates about fares, packages, competitions and exclusive offers. When planning a Shanghai trip, remember you can assemble your own holiday package using this website. During the fare booking process, you’ll have the option of adding travel insurance. After you've completed payment, we’ll offer you the option of booking accommodation through Expedia. For some time now, Shanghai has been one of the fastest growing cities in the world. The surge began in the late 1980s and the biggest transformation has occurred in the financial district of Pudong, where today’s futuristic high-rise buildings are clustered. While the city has been expanding and evolving, town planners have been careful to preserve history and the city's overall feeling of elegance. If you’re visiting for a few days, make sure you discover the old Shanghai attractions as well as the new. The balance between the two is what makes Shanghai so captivating. Like many river cities, Shanghai's central pulse can be found on the riverside strip - a promenade known as the Bund. It's a 'museum of buildings' where you'll see Romanesque revival, gothic revival, renaissance revival, neo-classical and art deco architectural styles. 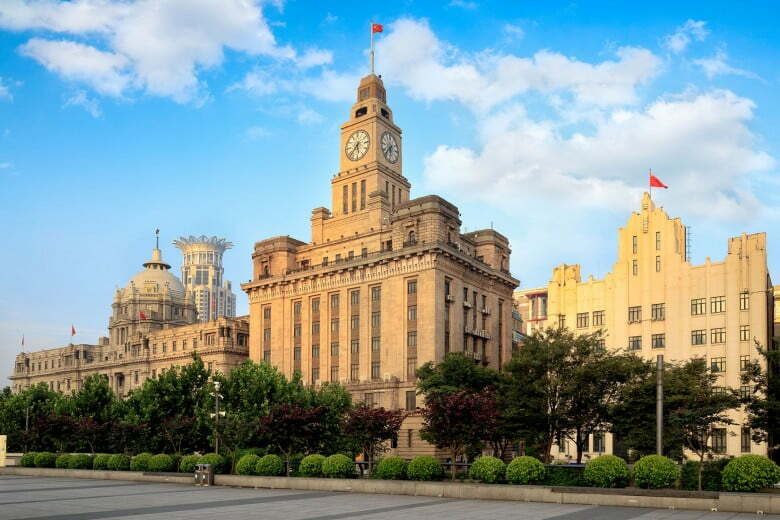 Standouts includes The Shanghai Pudong Development Bank, completed in 1923; Shanghai Customs House, built in 1927; Shanghai Foreign Exchange Trade Centre, from 1901; and the ornate Bund No. 18, previously a British bank. West of the Bund is the Old City (also called Old Town), the traditional urban core of Shanghai. There’s a concentration of heritage architecture and temples here, as well as the serene Yu Gardens. Stop off at the World Expo Museum to see old film footage, displays and models that explain the history of World Expos from 1851 to present day. Another historic area of Shanghai that you literally can’t miss, because it’s so large, is the Former French Concession (FFC). Elegantly leafy and loaded with heritage homes, it has multiple museums, quaint little shops and some exceptional places for eating and drinking. The FFC is also where you’ll find Jing’an Temple and the ancient alleyways of Tianzifang, which have been transformed in a way that has kept their traditional character intact. For a sightseeing day trip with a history focus, visit Zhujiajiao ancient town - it’s just an hour’s drive from Shanghai. Shanghai's inspiring skyline symbolises China's modernisation. The city's facelift, which took three decades and many billions of dollars, has resulted in a contemporary travel experience that stretches all the boundaries. Even the ride from the airport is futuristic - the Maglev Train can travel at 430km/h, getting you to the city in just seven minutes. If you're staying near the Bund, towers will be top of mind. Catch the subway or a taxi to the east bank for a few hours of engagement with Shanghai's extraordinary high rises. Also known as Dongfang Mingzhu, the Oriental Pearl Tower has three observation levels and a transparent panorama lift - it's one of the most popular places to go in Shanghai, because it looks like something from a science fiction movie. Shanghai Tower is even taller, with the world's highest observation deck. Or you can nip up the Shanghai World Financial Centre, which has great views of The Bund. People's Square is another place to appreciate how far Shanghai has come. You can visit the Urban Planning Centre, wander the square's park areas and catch a performance at the Shanghai Grand Theatre. South of the square are Xintiandi and Tai Kang Lu (Tianzifang), where old alleyways have become trendy laneways. Proper exploring around these areas requires a mix of shopping, eating and people watching. With Shanghai travel, every meal is a tour of the senses - whether you're eating at a street food stall or indulging in a multi-course fine dining experience. You'll want to chase down traditional dishes, like xiaolongbao dumplings and Peking duck. And we urge you to explore the unusual, such as raw drunken crab and stinky tofu. You should also be prepared for some dishes you wouldn't usually associate with China, like M on the Bund's ‘M Pavlova' - dry and crispy on the outside, soft as clouds on the inside. Champagne buffet brunches are another specialty on The Bund - nearly every major hotel does its own version of this all-you-can-eat morning decadence. As far as food budgeting goes, any level of spending is possible in Shanghai. You can eat like a backpacker, making a small amount of money perform miracles in the street food zones. It's just as easy to find a Michelin-star restaurant and invest in culinary genius that you'll remember for a lifetime. Oscillate between the two extremes and you'll have some scintillating food stories to take home. Shanghai can be your launching pad for deeper travel into China , the fourth largest country in the world. Nearly 60% of the population lives in urban centres, so once you get beyond the cities there's a lot of space for discovering astonishing landscapes that have been intriguing travellers for hundreds of years. Beijing is a logical add-on to your Shanghai holiday, because it has the Forbidden City and Tiananmen Square - two of China's most significant places of interest. Beijing is also handy to the Summer Palace and several sections of the Great Wall of China. China Railway high speed trains (bullet trains) are an exciting way to get from Shanghai to Beijing. West of Shanghai is Zhangjiajie, gateway to the historic Wulingyuan Scenic Area, a UNESCO World Heritage Site. While you're in central China, two other destinations demand a look-see - Xian, for the Terracotta Army; and Chengdu, the panda capital of the world. In southern China you can explore the surreal karst landscapes of Kunming and Guilin, then head to Xiamen on the coast - it's an island city with beautiful beaches and a fascinating mix of European colonial and modern Asian architecture. If you love a hot Asian summer, visit Shanghai in June, July, August or September. It’s the peak season for tourism, so book your accommodation well in advance. The shoulder seasons, spring and autumn, are popular because temperatures are less extreme and off-peak prices apply. Winter weather is chilly, but has less rainfall than the rest of the year. Not including air travel and hotels, you should allow about USD $70 to $100 a day per person for food and entertainment. Make sure your routine vaccinations are up to date. Hepatitis A and typhoid shots are also recommended. Travellers to Shanghai are generally required to apply for a visa before departure. Contact your local Chinese embassy.